Hey everyone! 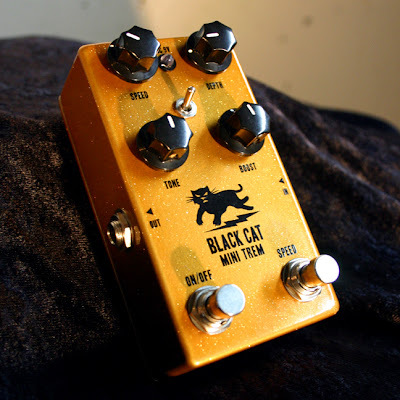 Black Cat Pedals now has their own News page, check it out - http://www.blackcatpedals.com/news. 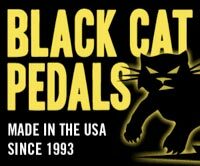 So any new info and news we have regarding Black Cat Pedals will now appear on the News page on the Black Cat Pedals website. We'll be keeping all the old Black Cat related posts just as they are on the For Musicians Only Weblog. 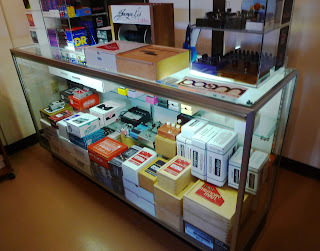 Wanna see our display case? 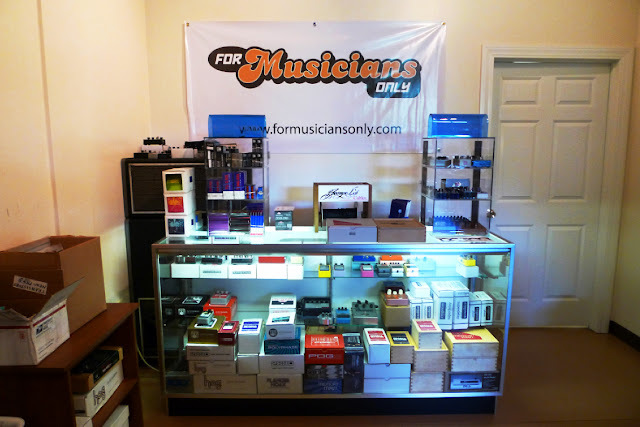 Here's a shot of one of our two display cases that shows what the back of the FMO Gear Shop looked like a couple of years ago. Both display cases are up at the front of the shop now. We had to make room for Greg's bench, which is now right about where the display case is in this picture. I can see some brand new pedals from Electro-Harmonix, Empress Effects, Blackout Effectors, and Red Witch. There are also used and vintage pedals; some Ibanez and Boss pedals, a couple of DOD pedals, an original A/DA Flanger, a Bixonic Expandora, and a Hot Chili Tubester. There's other stuff in there, but it's hard to see. Oh, by the way, all the wooden box Electro-Harmonix pedals are from my personal collection. Speaking of personal collection, you should see what's in the other display case! On top of the display case are two Electro-Harmonix tube display cases. The one on the left is filled with (appropriately enough) tubes, as well as lots of different DR strings. 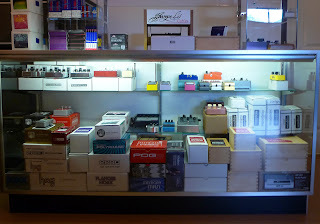 The tube case on the right contains some favorites from my boutique pedal collection. Finally, in the middle of the top of the display case is one of our 4 (four!) George L's Cable Warehouse kits. Yeah, four is a bit excessive, but I got every one of them on package trade deals of various kinds that were too good to pass up. The bulk cable and 1/4" plugs are great to have around and they've come in handy on many occasions. Yeah, this is a fun job. You thought we forgot, didn't you? Blog? What blog? Oh yeah, that's right... we have a blog! Well, we didn't forget about it, we've just been very (very) neglectful of it. It's not like there hasn't been anything going on either - there's tons of interesting stuff going on all the time. We just never seem to have a chance to sit down and make a blog post. Anyway, I'm not gonna promise we'll post every week or anything. As soon as I do that, I'm liable break my promise. I will say this though... we already have a couple of blog posts just about ready to go. After that, who knows? Maybe we'll just keep it going. I guess you'll just have to check in and see. We've been a little remiss in our blog updates as of late. The Black Cat Vibe has been taking up most of our time in trying to get it launched and available for sale. Not to worry though, we have a hefty backlog of stuff to post about. So we'll be sure to get all of it up in the next coming weeks for your viewing pleasure. Speaking of the Black Cat Vibe, here's a truly awesome video by Nick Jaffe (Just Nick) of the Black Cat Vibe. Nick did a great job on this one (as usual). I like the way he digs deep and discovers all the various nuances in the pedals that he demos. In this demo he shows how great the Black Cat Vibe sounds with some fingerstyle jazz comping, proving once and for all that you do not need to play Pink Floyd, Jimi Hendrix, or Robin Trower licks to demo a Vibe effect. A little side note: at the end of the video, Nick appears to say "Black Kit." That's apparently due to his Chicago accent. Be sure to check out Just Nick's YouTube channel for more of his great video demos. Sneak Peek: the NEW Black Cat Vibe! The Black Cat Vibe is fairly labor intensive and requires a great deal more skill to build than most guitar pedals, so the initial run will be built exclusively by our Master Technician, Greg Radawich. Given the amount of interest and email inquiries we've received over the past couple of years, we're expecting the initial demand to exceed the number of units Greg can build per day. Since we cannot yet guarantee definite delivery dates, we will NOT be accepting pre-orders. Therefore, it seems the best option is to start a wait list for anyone interested in ordering the new Black Cat Vibe. We're not expecting to have (and will do our best to avoid) an excessively long waiting list. We just don't want to accept payments until we actually have products available and ready to ship. To get on the Black Cat Vibe waiting list, simply email us your request to get on the list. Customers will be contacted in the order in which their requests were received. There's no obligation to buy the pedal, so you always have the option to pass when your number comes up. And you don't have to make payment until we contact you to let you know your pedal is ready. Then you can specify which version you'd like - stompbox or half-rack - when you make your payment. Remember, there's no obligation, so if you think you may be interested in getting the new Black Cat Vibe then you'll definitely want to go ahead and get on the list. You can reply to this thread (we'd like that actually), but that won't get you on the list. Please send us an email if you want to get on the list. 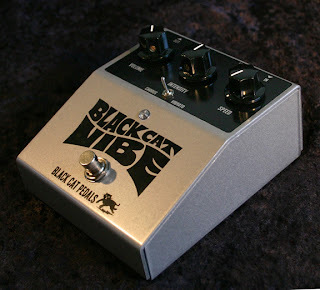 - The original Black Cat Vibe sold for $399 (plus $50 to add an expression jack). The NEW Black Cat Vibe will retail for $334.95 USD. That's $64.05 less than the original, and the NEW Black Cat Vibe comes already equipped with the expression jack to control the speed. (You can use a standard expression pedal, such as Roland EV-5 or Moog EP-2). - The NEW Black Cat Vibe uses a 12V AC power supply, just like the original. Your new Black Cat Vibe will come with its own 12V AC adapter (USA 120V AC only at this time). You can expect a confirmation reply from us within 48 hours after we receive your request with an ETA for when your pedal will be ready. Then we'll contact you again when your pedal is ready to ship. Thanks! Here's a quick, off-the-cuff video demo of a Ludwig Phase II Guitar Synthesizer that we were testing before shipping it off to a customer (Hey Glenn!). We weren't trying to do a full-fledged demo, just having a last bit of fun while we still had it. The ultra-funkinated guitar playing is courtesy of our own Mikey T (a.k.a. Keyboard Mike), who's actually a left-handed keyboard player jamming out on a right-handed guitar. Not too shabby, I'd say. I'm shooting the video with an iPhone and tweaking some of the settings. The Ludwig Phase II is know for that vocal "Yoy-Yoy Yoy-Yoy" sound, and variations thereof. The variation on this particular unit that day seemed to be more along the lines of "Yi-Yi-Yi-Yi." Here are a couple more Moogerfooger videos I posted on YouTube. The first one is called Modern Jazz Moogerfoogers, using a patch I got that sounded very much to me like an avant-garde modern jazz improvisation; something in the vein of Ornette Coleman or Eric Dolphy. Parts of it sound like a couple of horn players blowing hard bop & free jazz through some kind of funky effects filter. The saxophone type timbres are fairly convincing at times. I'm definitely hearing snippets of tenor and baritone sax in there; maybe some bass clarinet as well. There's also a brief interlude of this frenetic funky slap bass sound. Here's another patch I got on my rack of Moogerfoogers. This one ended up sounding pretty rude, so the 5-year-old in me just had to record it. Once again, the only sound generators/ sound modulators are the Moogers you see in the video (not counting a brief instance of cellphone audio interference). I did a good bit of knob twiddling in this one to give you a better idea of what's patched in and what's controlling what. Maybe I should start writing down the patches and settings, but I prefer to unplug everything and start over rather than trying to recreate any particular sound. Again, you can find the full range of Moog Music Moogerfoogers available for sale at the FMO Gear Shop. Here's a video I made last week featuring some truly bizarre sounds I got using several Moog Music Moogerfoogers. I was playing around with some patches on my rack of Moogers and it ended up sounding so weird, I decided to make a video. All sounds in this clip are generated and modulated by Moogerfoogers. Not all of them are hooked up for this patch, but the ones that are include the MF-107 FreqBox, MF-101 Low-Pass Filter, MF-102 Ring Modulator, MF-103 12-Stage Phaser, MF-105 MuRF, MF-104SD Super Analog Delay, and CP-251 Control Processor (plus EP-2 Expression Pedal). There were some very freaky vocal sounds happening here. Really weird (and kind of spooky when you're in a room alone with this stuff. Don't ask me how it was patched, I probably wouldn't be able to get the same sound again if I tried... BTW, I should dutifully mention that we sell the full line of Moogerfoogers at the FMO Gear Shop. Here's a project that's been long in the making. In fact, it's not quite finished, but that's no reason to keep it hidden from everyone. So here it is... introducing the Chromatropolis! This magnificently monstrous assemblage of analog synth gear is comprised of the Rhodes Chroma, Chroma Expander, and a brand new Chroma Enabler. I have christened the three units collectively as the Chromatropolis. I thought it deserved a much grander name than "Chroma stuff" or "Chroma, etc." I also thought it would be easier to use a single name as way of referring to the three units, rather than having to say "Chroma, Expander, and Enabler" over and over again. As far as I know, I am currently the only one who has all three units. 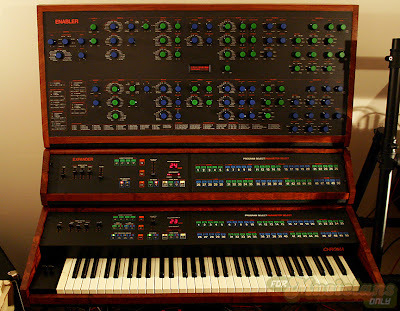 For those of you not familiar with the amazing Rhodes Chroma polyphonic analog synthesizer, check out the Rhodes Chroma website, which has just about everything you could possibly want to know about this incredible instrument. You can even get the back-story on my own Chroma, which can be found in the Rhodes Chroma Instrument Registry. I acquired my Rhodes Chroma on trade in 2006 in non-working condition. It took a couple of years for me to get around to making it functional, but once I finally got to hear and play it, I was amazed. Then, gear fiend that I am, I just HAD to get a Chroma Expander (basically, a Chroma without the keyboard) to go with it. 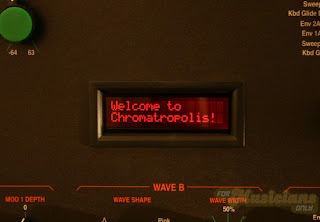 I finally found a Chroma Expander for sale around April 2009, so I eagerly bought it. I was told it was in good condition except that the power supply unit would need to be replaced, which is a common problem with the original Chroma. Since I had already done this on my Chroma, I figured it would be fairly simple to do on the Expander as well. Unfortunately, once I got the Expander and began replacing the PSU, I discovered there were a few other issues, not the least of which was corroded traces on the I/O board. The CPU had also suffered extensive damage from a leaky battery, but I had already planned on replacing that with the amazing CC+ upgrade. The Chroma Expander is still not functioning 100%, in spite of having work done by two different synth repair specialists. I was very fortunate to find a replacement I/O board, and installed both the PSU kit and CC+ that are available through rhodeschroma.com. At this point, six of the eight voices are working. I’ve already ruled out the voice cards as the issue, but haven’t yet been able to figure out the problem. But with the right help and the abundant resources on the Rhodes Chroma website, it’ll definitely happen soon enough. Shortly after I got my non-working Expander, I had a custom Bubinga wood case made for it and for my newly working Chroma, which I previously wrote about in my blog entry from August 2010. 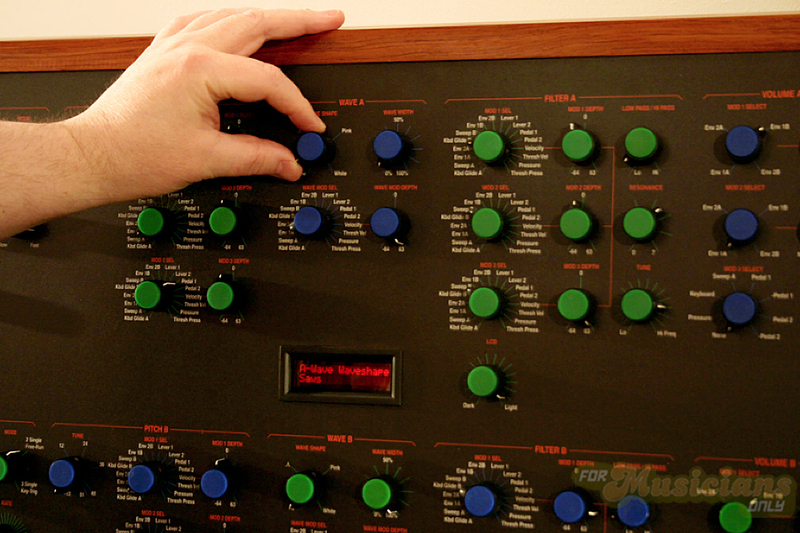 The Bubinga Chroma and Expander cases were made by Wes Taggart of Analogics. Around the same time, I also installed the Chroma Pressure Sensor (CPS) kit, which gives the Chroma keyboard after-touch control of any parameter assigned to it. The CPS kit was made available to members of the ChromaTalk discussion list and was designed by one of the members. Now, let me tell you about the Chroma Enabler... The Enabler is a custom controller made specifically for the Rhodes Chroma. 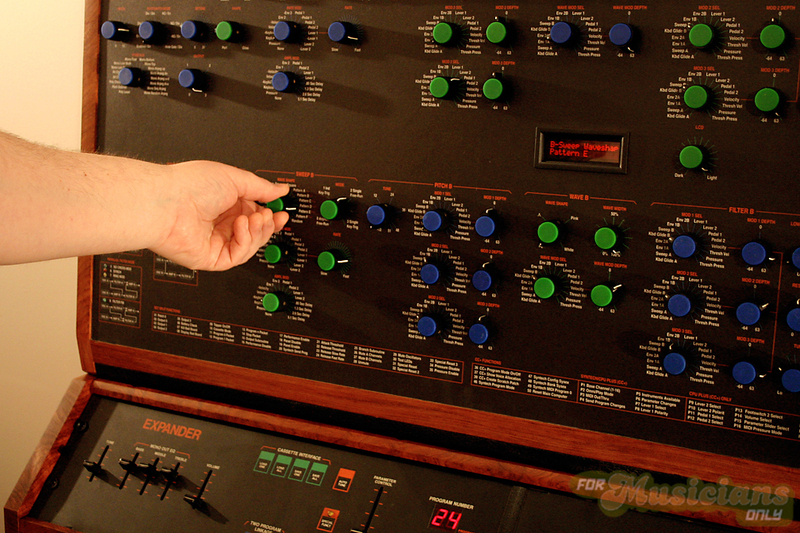 It was designed and built by Randel Osborne, who also owns a Rhodes Chroma and happens to live in Connecticut as well. Randel told me one day about this idea he had for making a controller for the Chroma that would enable the user to have manual control of all available parameters in real-time. He asked if I thought it was a good idea. I told him I MUST have one, please! Randel came over a few times during the course of his R&D to show me prototypes he was working on, which were much smaller breadboard units that only controlled a few parameters. It was great getting to watch the idea grow and develop, and he put a LOT of work into it. I think he’s made a total of seven or eight Enablers so far. The wood case for my Enabler is made of Bubinga to match the wood of the other two units. 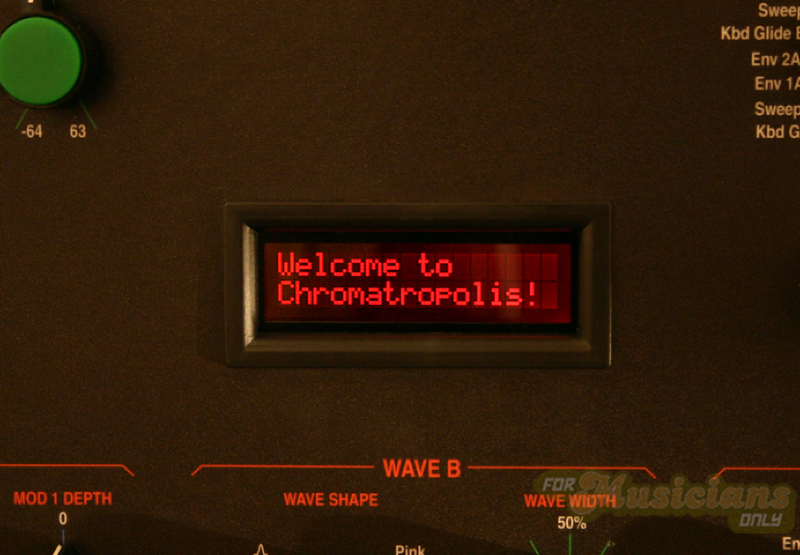 He also programmed the display to read “Welcome to Chromatropolis” on startup. You can read more about the Chroma Enabler on Randel’s website. So that’s the story of the Chromatropolis. I’ve had it as shown in these pictures for a few months now, and it’s caused me to stay up much later than I intended on many, many nights since then. A Chromatropolis video is definitely on the short list of things to do this summer. Black Cat Vibe Prototype Video! And MORE Videos! Check out this quick demo video we made of Black Cat Sara playing a prototype of the new Black Cat Vibe we've been working on. There are a LOT of loose ends to tie up before we have this ready for release, but we're planning to make it available for sale sometime this summer. Stay tuned! Want more videos of Black Cat Pedals? You got it. Here's a really good one of the Black Cat Bass Octave Fuzz from Jeff B (MrExcane). Sounds awesome with the SubDecay Quasar Deluxe! Finally, here's an excellent and very insightful video of the Black Cat Mini Trem by Jordan Wagner for Premier Guitar. Here's an interesting pedal we made a while back for Alex in Canada. 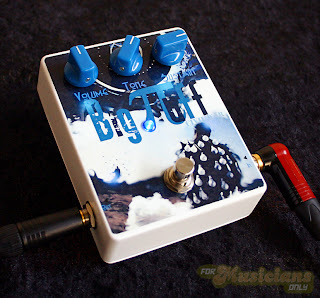 It's an FMO Custom Civil War Big Muff. Alex requested that we build him a Civil War version Russian Big Muff using a graphic he had designed himself. I passed the artwork along to Sarah Radawich, who skillfully added the lettering and gave us the finished layout. The rest of the work on the pedal was then handled by our Master Technician, Greg Radawich. I really like the way this turned out (be sure to click on the picture to see the larger version). It's definitely a cool looking pedal. Alex is apparently a huge fan of Pink Floyd, which I think is reflected in the graphic... it reminds me of the album cover art that Storm Thorgerson did for all those Pink Floyd albums. We got a custom pedal request a couple of months back from Brad Scott of Ontario, Canada. 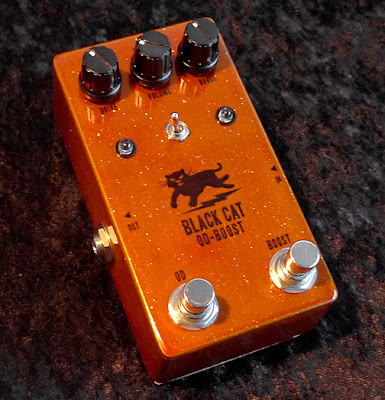 Brad wanted us to make him a Black Cat OD-1 with an independent buffered boost channel in a Mini Trem sized enclosure. In addition, he asked if we could add a mini toggle switch to reverse the order of the OD and the Boost. My first thought was that Brad really wanted to blow his speakers! The OD-1 is so insanely loud to begin with, I could only imagine what it would be like coupled with a boost. But it seemed like he had really put some thought into it and knew exactly what he wanted. I relayed all the info to Greg, and then Greg went about creating the Black Cat OD-Boost you see pictured here. Okay, here’s how it works: the two footswitches give independent control of the OD and Boost channels (similar to the Black Cat OD-Fuzz). Each switch is an on/off for its own channel, so you can have just OD, just Boost, or both at the same time. There are Drive and Volume controls for the OD channel, and a single Boost knob to control the level of the Boost channel. I have to say, the Black Cat OD-Boost turned out to be a GREAT idea (Thanks Brad!). The two channels compliment each other extremely well. There are so many useful combinations with the two circuits, especially with the toggle to switch the order of the two channels. Of course, it can be VERY loud if that’s what you want. But you can also get an endless array of gritty dirt tones, or just put some more muscle into what you’ve got already. It didn't occur to me to actually blog about it until Sara suggested it, but we've been listing a ton of really cool vintage effects pedals in the FMO Gear Shop lately. If you haven't stopped in for a while, you should definitely check it out. Among some of the noteworthy listings have been a Ludwig Phase II Synthesizer, WEM Rush Pep Box, John Hornby-Skewes Zonk II, Audio Matrix Mini Boogee, Mu-Tron Bi-Phase, Mu-Tron Flanger, Systech Overdrive, Ibanez AD-80 Analog Delay, Electro-Harmonix Talking Pedal, Electro-Harmonix Queen Triggered Wah, Lemon Studio Sound Stretcher A, Maestro Filter Sample/Hold, Keio Singing Geisha Synthesizer Traveler, with several more items yet to be listed. After a rather lengthy lull during most of the recession, the FMO Gear Shop has seen a surge of activity over the past couple of months with all these new listings. We've had a few vintage pieces that came in and got sold so fast, we hardly had time to play with them. Alas, payroll and overhead are great motivators for moving things along, so away they go... I've also decided to scale down my collection of vintage keyboards and analog synthesizers. So we'll be selling a Fender Rhodes Stage 73 Mark II electric piano, RMI 368x Electra Piano and Harpsichord, Univox Mini Korg analog mono synth, and a Multivox MX-440 String & Brass (a string ensemble identical to the Roland RS-202). 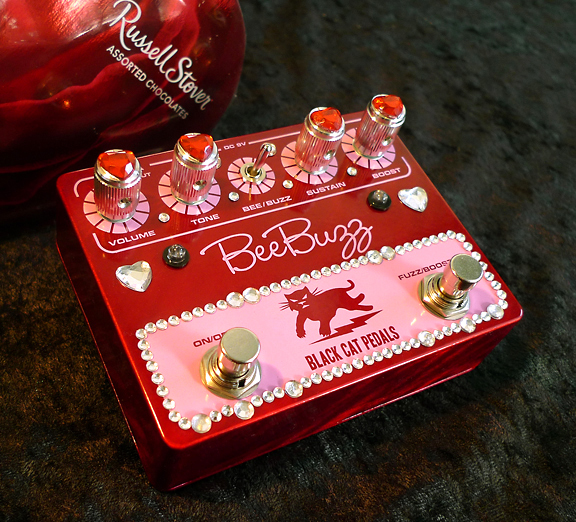 Check out this limited edition Valentine's Bee Buzz from Black Cat Pedals! A manufacturing mishap left us with five red Bee Buzz pedals with a PINK silkscreen. There's a story behind this one that's sure to leaving you feeling warm and fuzzy. When we got our last batch of Bee Buzz powdercoated and silkscreened, the red ones had a bit of a problem - the white paint on the silkscreen turned out pink! So we had a bunch of red and pink enclosures. Greg jokingly said that they looked like they could be Valentine's pedals. I thought that was actually a good idea, so we saved five of them and had the rest rescreened. It seems I didn't learn my lesson after my attempt to do the graphics for the Black Cat Halloween pedals. So what you see here is yet another of my forays into stompbox arts and crafts. Sure, it's not for everyone, but I think it turned out rather well. So the five red and pink enclosures were transformed into Valentine's Bee Buzz pedals, complete with heart-shaped rhinestones, and were offered to our mailing list subscribers. Each of the Valentine's Bee Buzz pedals came with a box of Russell Stover chocolates. I thought I may have gone a little overboard with the bling, but all five pedals sold within three hours. Here's a custom modded Black Cat Mini Trem we made a few months ago for Grant in Australia. Grant contacted us and asked if we could make a Mini Trem for him with slightly different features. Instead of having the second footswitch toggle between half-speed and double-speed, he wanted it to toggle between full tremolo depth and the regular variable depth, which is controlled using the Depth knob. He wanted to be able to go from an all out stutter/chop trem to a mild pulsing trem at the click of a switch. So I asked Greg if he could do it, and of course he said it would be no problem. He also suggested that Grant didn't even have to lose the half/double speed option - we could just add a mini-toggle switch to handle that function. So that's what the toggle switch is for on this Mini Trem. Grant loved it! He even asked if we might someday make him a custom Black Cat Vibe and Mini Trem in one unit. Of course, we'd have to finish up the Black Cat Vibe prototype we've been working on first.